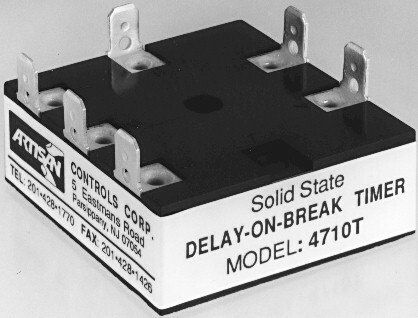 The model 4710T offers excellent transient protection and provides for reliable timing control. The model 4710T is capable of controlling remote DC loads to 1 ampere at voltages up to 150V DC. Closure of the Initiate Switch turns on the remote load circuit and resets the timing to zero. Opening the initiate switch starts a preset timing period. The load circuit remains energized until the timing period has elapsed, then de-energizes. If the initiate switch is reclosed before the timing period has been completed, the timing cycle will reset and the load circuit will remain energized. The model 4710T is available in both fixed and adjustable models. Output Rating 5 milliamperes to 1 ampere inductive with inrush current to 15 amperes for 8 milliseconds. Timing Mode Delay-On-Break, initiate switch activated. Timing Range 0.1 - 4,500 seconds. Operating Temperature -40 deg C to 85 deg C.
Repeatability of Timing +/- 1%.